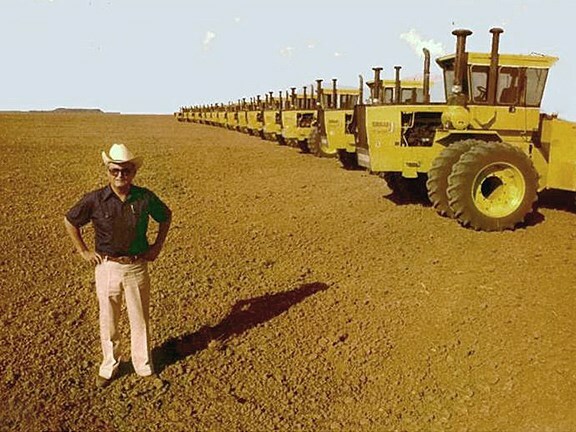 Jack Fletcher with a fleet of Steiger Tractors for his 250-square-kilometre Camballin Farms. Finding water in the Kimberley. 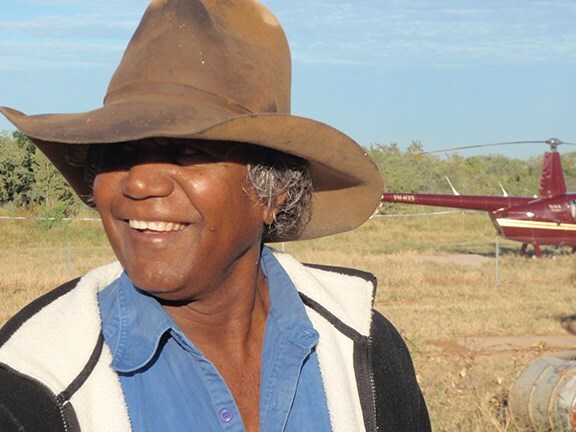 Jimmy Shandley, an elder of the Goondiyandi indigenous community based at Fitzroy Crossing. 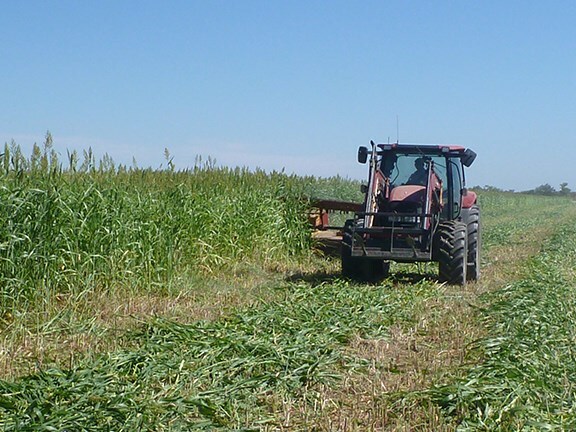 Cropping sorghum in the Kimberley. My social interests in life have been many and varied but when it comes to working interests, well, they are only based on heavy machines and the jobs they are used on. Agriculture, mining, subdivisions, roadworks, pipelines, construction, irrigation, you name it — as long as it concerns equipment, I’m there. In the past was just happy to be involved; it never really concerned me who was behind the major projects on which I was working. That was until I met Jack Fletcher. His story intrigued me so much I just had to pen it. This is Jack Fletcher’s remarkable story. 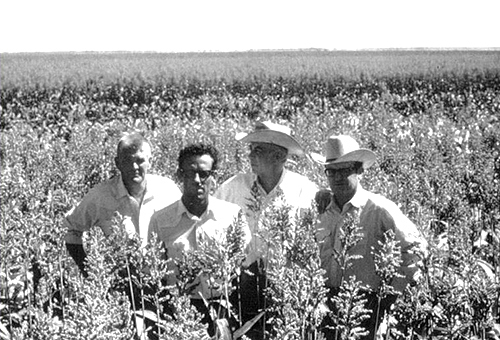 Standing in the sorghum crop on Camballin. Jack Fletcher is on the far right. Born and bred in Texas, Jack Fletcher is a true pioneer and visionary. He came to Australia almost 60 years ago with years of experience under his belt in finding, securing and successfully implementing major water irrigation schemes all over the world. Besides working in his native state, Jack pioneered development in countries such as Bahrain, Belize, the Dominican Republic, Malaysia, Mexico, Nigeria and Libya, where his efforts in discovering the largest known artesian basin in the world led to the construction of the $29 billion ‘Great Man-Made River’, or GMR. This project consisted of laying a 12.3m-diameter pipeline 2,820km across the Sahara Desert to take water from the Nubian Sandstone Aquifer System fossil aquifer to the cities of Benghazi and Tripoli. The system consists of 1,300 water wells (bores) which supply 6,500,000 cubic metres of water daily. Studies based on 2007 water use have indicated that there is enough water to last for a thousand years. Due to Jack’s efforts, the once vast Saharan wasteland has been transformed into a productive and profitable agricultural enterprise. Jack Fletcher & Co also had the foresight and experience to see the untapped potential that lay in the northwest of Australia. In the 1960s Jack came to prove that this remote and forgotten area could not only hold Australia’s future for agriculture and cattle production but supply quality food to the rest of the world. If Jack Fletcher’s 1960s-based ideals eventually come to fruition and continue to attract private and Government investment, the Kimberley could well become Australia’s next ‘mining boom’ and create thousands upon thousands of jobs for all Australians. 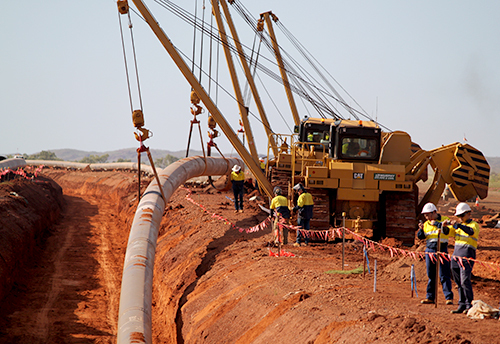 Laying pipes across the Kimberley. 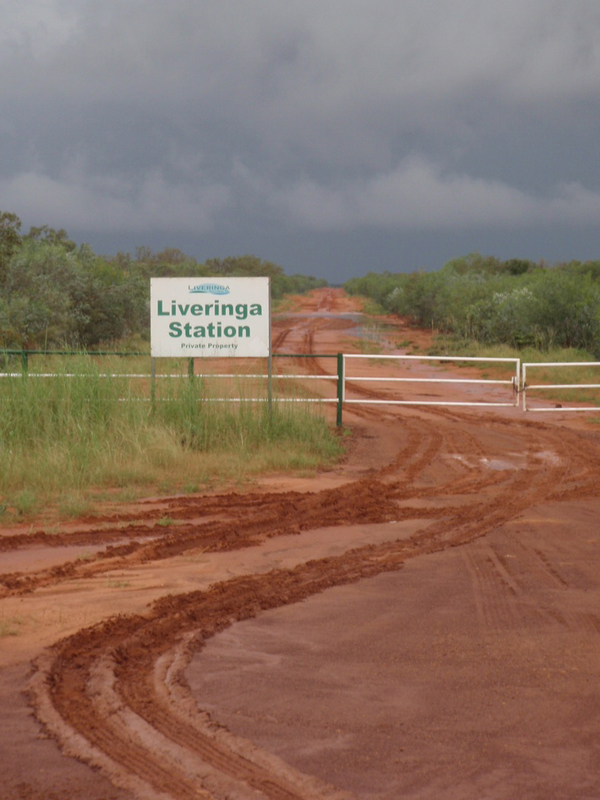 If you ever have the opportunity to visit northwest Australia, you will find that, other than the sparse, remote mining camps, the area is basically untouched and devoid of what most other Australians would consider basic infrastructure. On one side of the equation you have the rich mineral deposits just metres below the ground but there is another source of abundant wealth just waiting to be exploited. To the north of where Jack’s good mate Lang Hancock discovered the world’s richest iron ore deposits lie the rich alluvial black and pindan soils of the Kimberley and huge volumes of underground water. Major funding from the federal and state governments and massive investments from Australia’s biggest mining magnates and others in the private sector has generated a new interest in the region. The development of the Kimberley would mean jobs. Not just any jobs — construction jobs. And machinery — plenty of machinery. Not unlike the construction boom in the mining sector, to develop this country for irrigation is like constructing thousands of acres of subdivisions: clearing of vegetation; re-shaping the land to minimal gradients to enable water flow; drainage systems and canals; bores; hundreds of kilometres of pipelines; roadworks; construction of sheds and housing; transport facilities and trucking operations; farming machinery and dealers; crushing contractors; supporting industries; and major dam infrastructure projects. All of that requires earthmoving equipment by the boat-load. Ron Horner with members of the Looma indigenous community based on the Kimberley’s Liveringa Station. Jack Fletcher’s achievements in the Kimberley read like a fictional account of someone’s dreams. He formed the Australian Land & Cattle Company (ALCCO), developed seven cattle stations covering 17,400 square kilometres (4.3 million acres) and stocked with 100,000 cattle and 1,500 horses, built feed yards and packing plants, and created agencies for Shell, Goodyear and road train freight for the region. ALCCO exported 37 percent of all beef products from the Kimberley and was the largest employer of indigenous people in the region. In fact, over a 20-year period the company put $1 out of every $3 into circulation in the Kimberley. ALCCO also represented the largest single private agribusiness investment in the history of the Kimberley; it was the first foreign private company to go public in the United States; and, being vertically integrated, it was the largest company of its type in Australia. If that’s not enough to hang your hat on, Jack also documented and proved up an artesian-sub-artesian Kimberley aquifer the size of Spain. 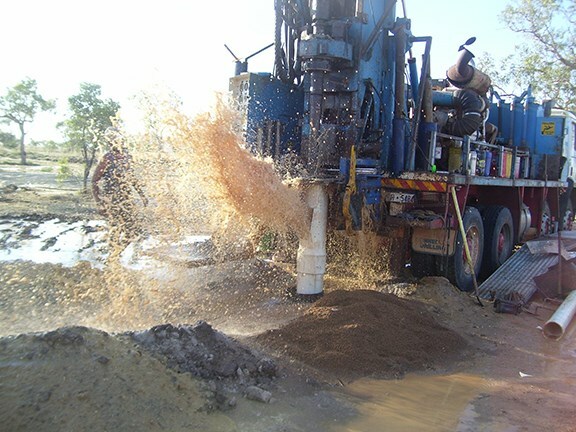 Bores were drilled to 500m and produced 8,000 litres per minute with a 90m drawdown. Jack used all of his entrepreneurial skills to negotiate an Act of Parliament calling for the development of his Camballin Farms. 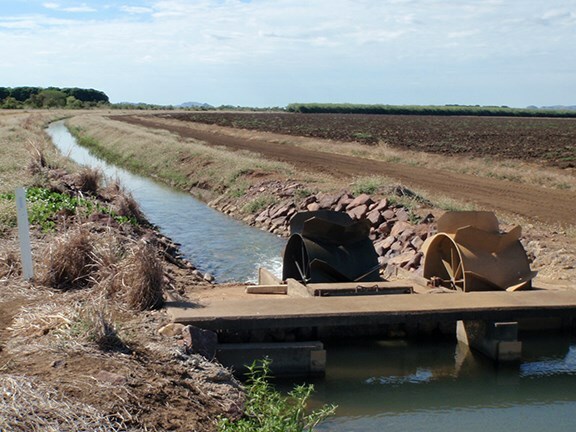 At 250 square kilometres it was twice the size of The Ord River Scheme at Kununurra, with 165 square kilometres of grain sorghum, cotton, sunflower and other crops. This led to the development of the Port of Broome in 1980 from a tidal port into a deep sea port and opened the town to trade, tourism and all ships. He also very nearly managed to dam the Fitzroy River. To find out what happened to Jack and his dreams, I’d recommend reading his book To Dam or Be Damned : The Mighty Fitzroy River. It’s an inspiring case study for young entrepreneurs in that it chronicles the rise of ALCCO and the reasons behind its fall in the 1980s. More recently, the Kimberley Plan which Jack hatched so many years ago has been pushed into the spotlight by a few developments: the Federal Government announced $5 billion of funding loans for the development of the Kimberley; Andrew ‘Twiggy’ Forrest’s Fortesque Metals Group launched a takeover of Harvey Beef, WA’s only accredited beef exporter to China;, and 50 percent of Jack’s old Liveringa Station was picked up by mining magnate Gina Reinhart for a whopping $40 million — as well as the Waroona Abattoir south of Perth. By all accounts, Gina will not be sitting back as a silent partner. Rumour has it that she will be actively pursuing further development of these properties and securing Asian markets for the quality beef cattle and, hopefully, crops produced in this region. This can only prove to be a good thing for the Kimberley and Australia, and will guarantee that future development will not be stalled. In fact, a late development in this story is Gina’s purchase of the ‘Taj Mahal’ of the Kimberley Outback stations, Fossil Downs, for a reported $30 million. Owned by John and Annette Henwood and located at Fitzroy Crossing this purchase will certainly push the viability of the region’s agriculture and cattle production opportunities. Even though we produce vastly more food than we as a nation could ever consume, we need to realise that in the not too distant future food security will play a most important role in our and the world’s economies. It’s already a problem for many of our export neighbours and customers. The Kimberley is perfectly located within a two-day boat trip or eight-hour direct flight of the majority of the world’s 7-billion population. China itself has a population of 1.4 billion people. Northern Australia has the ability to produce enough food to supply China, India and the South East Asian countries with a significant amount of excellent-quality, low-cost and disease-free food. As Jack Fletcher says: "To enable Australia to actively pursue its rightful place as a world leader in the supply of quality food to the world … just add water. Watershed storage is the key to our success." Jack Fletcher — World War II veteran (he was attached to the Third Marine Division during the Guam and Iwo Jima amphibious campaigns in the Pacific), Texan Hall of Famer, author, entrepreneur, Kimberley Cattle King, irrigation pioneer and visionary — is now pushing 90 years of age but is still full of knowledge and active in mind, and refuses to park up his aging body. Jack has never given up on his dream of making the Kimberley into the ‘Food Bowl to the World’ but wonders if he will live to see Australia reach its true potential. Blokes like Jack Fletcher are as scarce as a one ended-stick. He’s a larrikin, a legend, a pioneer and a visionary and, most of all, a bloody good bloke.